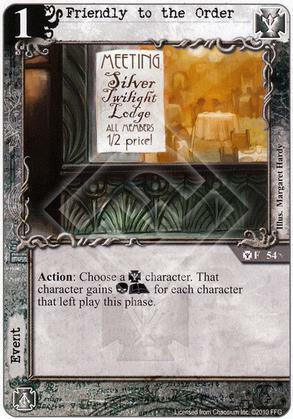 Action: Choose a Silver Twilight character. That character gains (C)(A) for each character that left play this phase. Basically, this card is kind of the Initiate of Huang Hun buddy, because he makes a lot of characters leave play. Each Initiate grants CCAA, and you can play him multiple times. But, it's still not ALL that great. You can probably get the job done with one of the other 1-cost icon-granting cards like Steal the Soul that's less situational. Also, Initiate is Restricted now, which wasn't the case when the card came out. There are other ways to make characters leave play, but the basic point about being situational still stands whichever ones you use. Initiate just happens to trigger it twice as hard as most other effects. Pairing Initiate with Friendly to the Order would mean the bouncing has to take place during operations, wouldn't it? I can see using that to boost up available icons for Calling the Darkness, but it looks like the gain in icons wouldn't last to the story phase. expire at the end of the current phase. You could get a similar two-for-one bargain with Faceless Abductor during the story phase, at least. 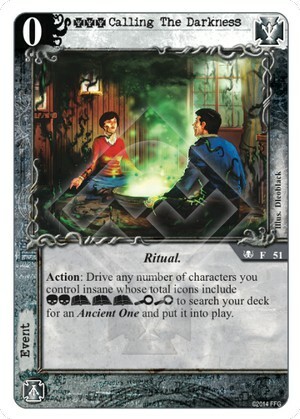 How about pairing this with a Cthulhu/ST deck? Instead of bouncing, use hard removal like Khopesh, Temple-Gustaf or BRB + Eldritch Nexus + repeat DOA? This could also work well with Agency/ST, again using BRB + Eldritch Nexus + Shotgun Blast, Shotgun, or The Foundation (with synchs up nicely with Eldritch Nexus anyway). The question is, which ST character do you want to bump? For Agency, I'd go the day-deck route, which means Guardian of Dawn is a good early game choice, though giving it to Master of Myths might be a nice surprise too. I enjoy buffing Recruiter for the Lodge -- usually that happens via Sarah Van Shaw, but an innocuous character unexpectedly growing teeth is always a treat. Apply the effect to BRB (who ideally has some Fated tokens you'd like to get rid of), then turn him insane - voila, you just gained a(n almost) free Ancient One.